For Poland, former prime minister Donald Tusk’s elevation to the presidency of the European Council wasn’t the end of a complex inter-institutional process so much as the launch of a new domestic political process. When former parliamentary speaker Ewa Kopacz, a Tusk loyalist and former health minister, succeeded Tusk as Poland’s second female prime minister on Monday, she did so with a reshuffled cabinet that she will hope to lead into the next Polish election, which must take place before October 2015. For the time being, Kopacz (pictured above, left, with president Bronisław Komorowski) is expected to act as little more than a placeholder for Tusk, and the rap on her is that she won the job through her loyalty to Tusk, not through any innate political ability or policymaking chops. For now, she’s expected to do Tusk’s bidding, even as he and his team head for Brussels. It’s rumored that Komorowski disapproved of Kopacz’s elevation to the premiership, and there’s no shortage of figures within her own center-right Platforma Obywatelska (PO, Civic Platform) who would rather be prime minister instead. But if she wins a mandate in her own right, Kopacz could gradually build her own political base and, as time passes, you can expect Kopacz to develop her own policy priorities separate from Tusk’s. European offices — what next? RELATED: Who is Radek Sikorski? Tusk, Mogherini appointed to top European offices. What next? The European Council appointed Polish prime minister Donald Tusk as Council president and nominated Italian foreign minister Federica Mogherini as its new high representative for foreign affairs and security policy. The appointments of both Mogherini and Tusk were widely expected in the days and hours leading up to today’s EU summit. 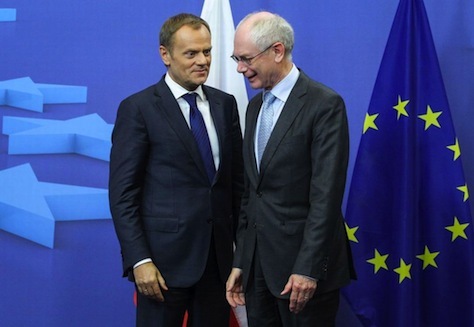 Tusk (pictured above, left, with his predecessor, Herman Van Rompuy), age 57, was first elected prime minister in 2007 and reelected in 2011 as the leader of the center-right Platforma Obywatelska (PO, Civic Platform), each time defeating the more conservative, nationalist Prawo i Sprawiedliwość (PiS, Law and Justice). Essentially a moderate liberal and European federalist, Tusk has governed Poland for seven of the 10 years during which it’s been a member of the European Union. His elevation to the Council presidency marks the first time that a central or eastern European has held a top EU office, and it reflects Poland’s growing clout as one of the engines of the European Union. 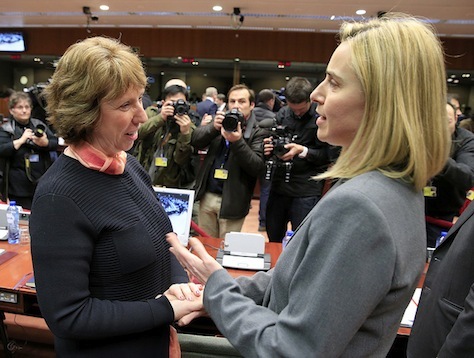 Mogherini (pictured above, right, with her predecessor, Baroness Catherine Ashton), age 41, only recently became Italy’s foreign minister in February, when prime minister Matteo Renzi maneuvered his way into the premiership. Though some Baltic and eastern European leaders doubted her level of experience and questioned whether she might be too sympathetic to Russia, she’s received strong marks in her six months as Italy’s foreign minister, marking her as a rising star in the new generation of leaders in Renzi’s center-left Partito Democratico (PD, Democratic Party). RELATED: Who is Federica Mogherini? Together with Jean-Claude Juncker, the former Luxembourg prime minister, who was nominated by the Council in June as the president of the European Commission, the EU’s chief executive and regulatory body, Tusk and Mogherini will be responsible for setting EU policy through 2019. The Council presidency was created by the Treaty of Lisbon, which came into effect only in 2009. Before Lisbon, the Council president was simply the leader of the country that held the six-month rotating Council presidency. Van Rompuy, a former Belgian prime minister, served as the inaugural Council president. Upon the Council’s decision today, Tusk will begin his first term of 2.5 years in December, with the option for reappointment to a second term of 2.5 years. The high representative role existed prior to the Lisbon Treaty, but it was greatly expanded when Ashton, a former Labour member of the House of Lords, was appointed to the role in 2009. Technically, Mogherini will serve as Italy’s representative on the European Commission and, accordingly, her term will run for five years and is subject to the approval of the European parliament. Given their different backgrounds, Tusk and Mogherini were viewed as a complementary team. Eastern and central Europeans are delighted to see Tusk, a relatively hawkish voice on Russia, elevated to the Council presidency. Meanwhile, Mogherini brings gender diversity to the Commission, and she will join Martin Schulz, a German social democrat, as the chief voice of the center-left at the top of the EU policymaking apparatus.